In grad school, I learned to be really good at answering questions. You had to be—English departments, in striving for quantifiable excellence that might mirror their scientific sister departments, have come to prioritize things like thesis statements, highly specialized arguments, and the propping up of one’s reasoning on legs made of unquestionable steel. But poetics and creative writing are what brought me to the English department, so I was already imbued with the seed of a natural suspicion, and a desire for play, when it came to all things made of language. And as my ability to answer questions, look for concrete symbols, and analyze themes became stronger, so did my ability to wonder about everything I was doing. 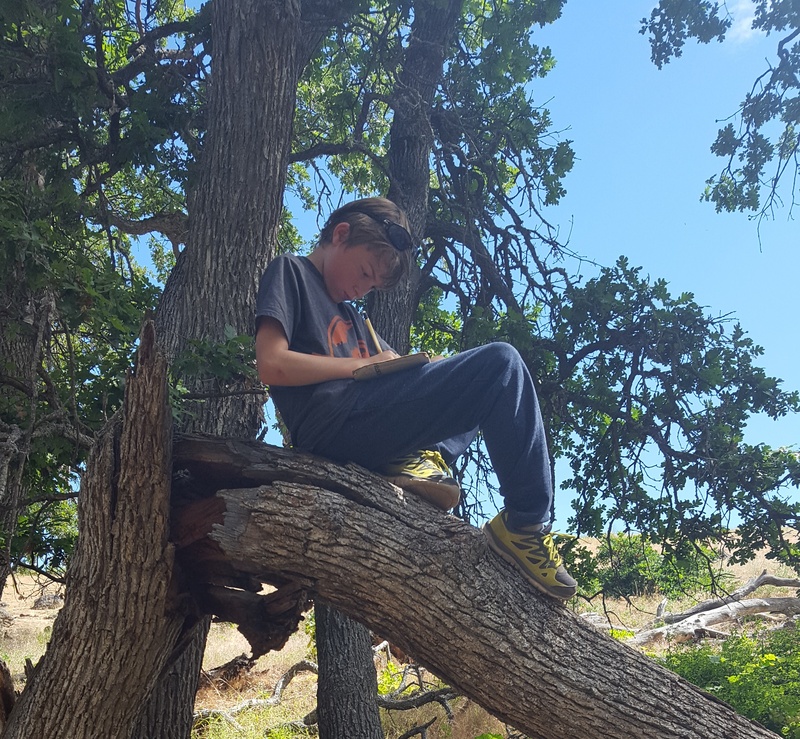 At CGEI, our SECRETS field trips are the culmination of 8 weeks of place-based curriculum, implemented in classrooms all over the Gorge. We spend these weeks working through basic environmental concepts—relationships found in nature, plant and animal adaptations, etc., all framed as “secrets” of the local ecosystem—and then we get to celebrate by going on a field trip where we take the kids outside, play games, and discover what we’ve been talking about as found in real life. 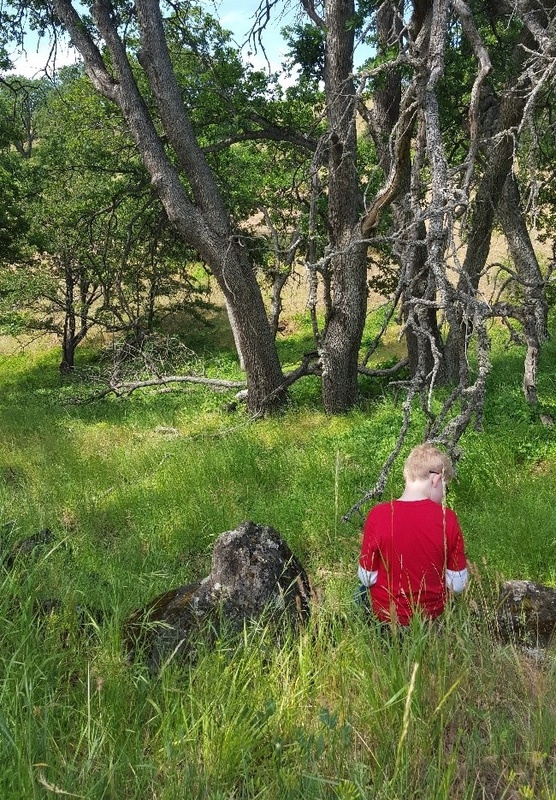 One field trip station, called “Solar Treasure,” consists of a mini hike and/or exploration time, followed by what we call a “sit spot.” The idea is that, in addition to our five basic senses, students have a chance to work on their less commonly cited but just as crucial sense of wonder. 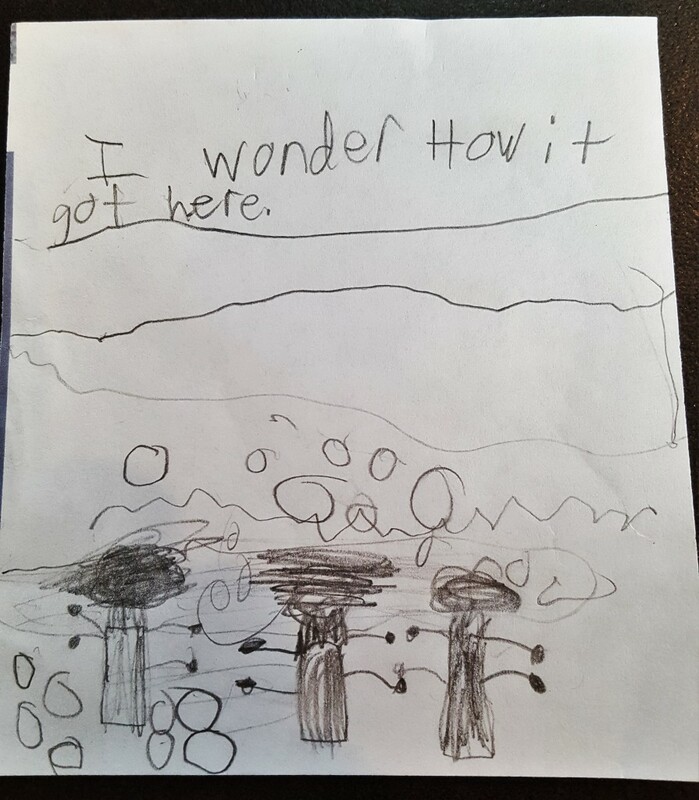 I give them each a piece of paper, a little handmade clipboard, and ask them to find a spot at least 10 feet away from each other, where they can sit down and respond to this prompt: “I wonder….” Students sit on flat rocks or on tipped over logs. They find hidden spots in the shade or, if the wind is cold, places where they can absorb some sun while writing. On exceptional days the entire group gets quiet. 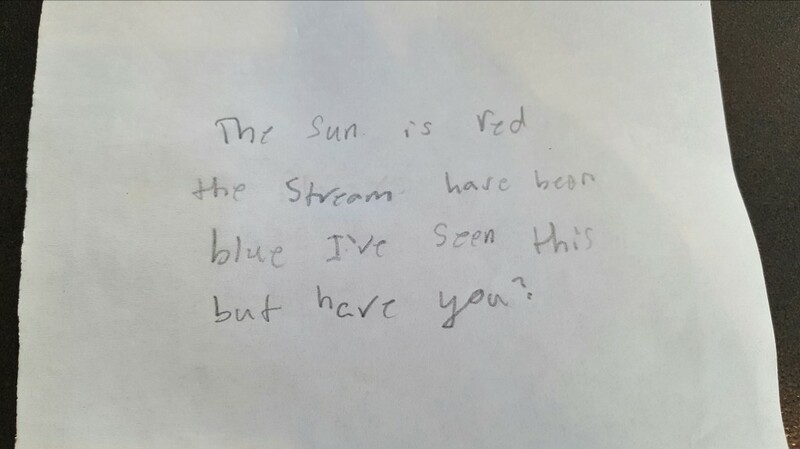 They draw, write sentences, and imply question marks whether they’re using them or not. During this time I, too, find a place to sit down, where I observe their suddenly smaller movements, anxiously awaiting their creations and asking myself whether the act of wondering is visible in one’s body—the tilt of your head, the placement of your arms. Near the end of my Master’s program, I took something called the comps exam: a “Comprehensive Examination” that occurs during a 48-hour period, Saturday to Monday, in which you are expected to write, from start to finish, four essays. These essays consist of answers to a list of questions, which you receive no sooner than the start of the 48 hours, and the questions pertain to an even longer list of texts, which you were expected to have been diligently studying all year long. The idea is that you produce, in a quantifiable space and with strict page requirements, tangible, “correctly” supported answers. There’s no room for wonder, let alone doubt: excitement and curiosity will only work against you in the midst of such strict requirements. The pleasure of writing becomes a temporarily foreign thing, as the exam attempts to ensure that I’ll be walking away with an ability that can be measured, the quantifiable shape of a successful answer. How does my background, my history, shape the questions I find myself currently asking, the things I still mistakenly desire to answer with certainty or prove entirely? Or the work I do, and the way I do it? I’m working on better ways to lead Solar Treasure, to introduce the “sit spot” to students. Sometimes I tell them that I have a bonus secret and I need their help completing it. 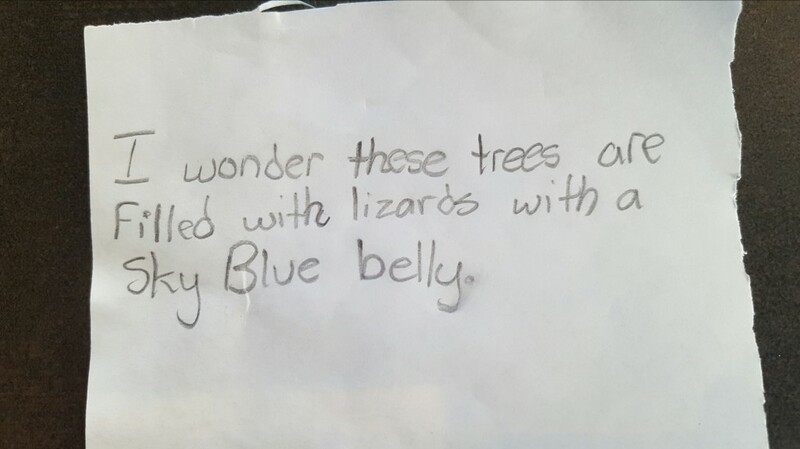 Sometimes I ask them what the word “wonder” means to them. 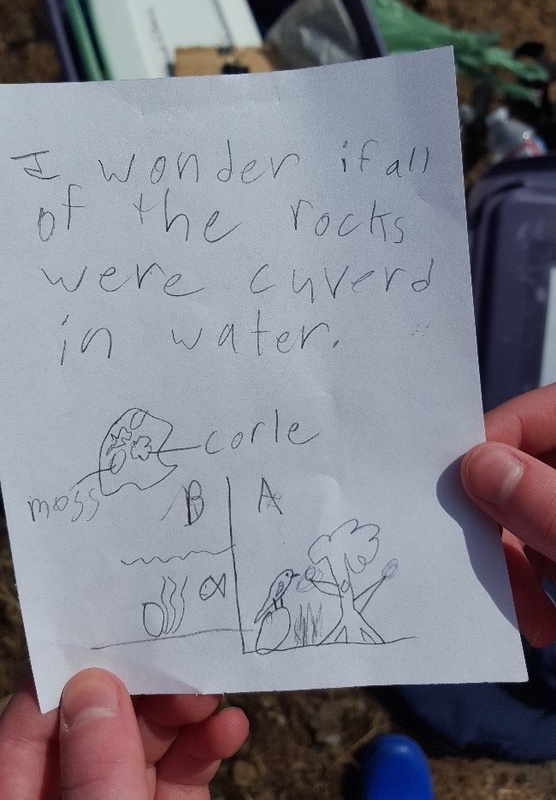 I always wish I could convey to them a sense of excitement plus reaching, minus a destination point: this sense that you can engage your curiosity without reaching toward a particular solution. You wonder about a thing because it is unfamiliar to you and nevertheless exciting and inspiring—it doesn’t require that you know much or anything of it before you can experience it as pleasurable. The act of wondering is the pleasure itself. I’m never quite sure how to communicate this idea to them—which is perhaps for the better, as my own version of wonder, shaped by a history of seeking answers that might need to be measured, is surely quite different from theirs. So I suggest a few options for responding to the prompt—a poem, a list of questions, a doodle—and urge them to discover their own; it is my awkward and too-formal attempt to say: be unquantifiable! They always come up with fantastic ideas, good stewards of empathy and scholarship, of the water and the trees. I learn from them what they so easily know: that the divide between learning and playing is an artificial one. That it’s easy to live the questions because they’re already alive.